Note: Originally published on my old website on March 4, 2011 and being re posted here on my new site. This is a quick and easy pizza dough that has withstood the test of time in my busy family kitchen. My No Rise Pizza Dough is quickly made in the food processor, doesn’t require lengthy rising time, and is very family friendly. Okay, folks, here’s my slam dunk all-time favorite pizza dough. This dough can be made in under five minutes in the food processor and it needs no tedious rising time. This No Rise Pizza Dough is the one I use when making a simple thin crust pizza, chubby calzones, savory cheesy flat breads, individual grilled pizzas or massive rectangular pizzas. My version is adapted from one I found in Abby Mandel’s Fast and Flavorful New Food Processor Recipes Volume 1 published in 1985 by the Cuisinart Cooking Club. Abby was a food processor maven who hailed from Chicago. Pizza was one of her favorite foods. Although Abby is now deceased, I called her about two years ago and spoke to her directly about this particular pizza dough. I wanted to know why it didn’t need any rising time. Abby mentioned that it had something to do with the sugar and the yeast. Indeed, the quantity called for is higher than normal, which may explain why this dough can skip the rise and roll right into action. 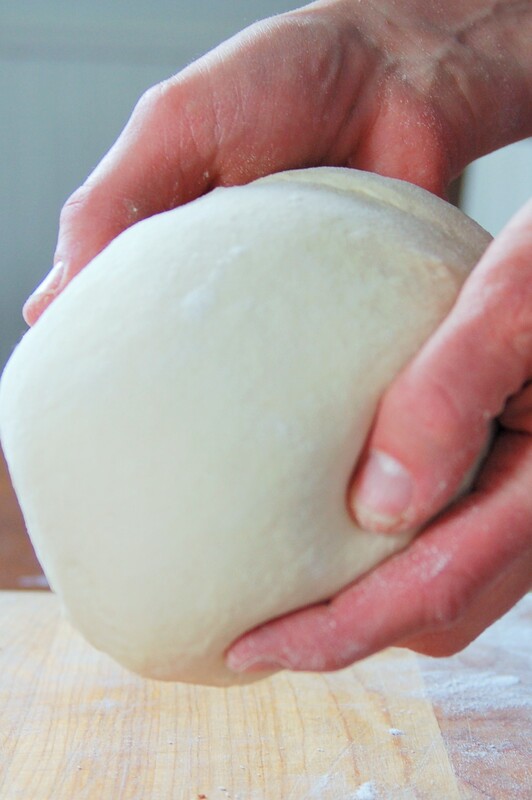 This dough is also very easy to roll or stretch into a thin disk. My family loves this dough so much that I sometimes make quadruple batches in my 20-cup DLC-X Cuisinart food processor. If we don’t use all the dough in one round, I tuck the dough into a food storage bag, tie it loosely and store in the fridge for a day or two…having my No Rise Pizza Dough at the ready is speed cuisine at its best! In the glass measuring cup in which the water was measured, add the yeast and sugar to the water. Stir well to combine and let stand for a couple minutes to activate the yeast. In the food processor fitted with the metal blade, combine the bread flour, salt and olive oil. Pour the yeast mixture through the feed tube while the machine is running. Let the machine run until the dough starts to form a ball. Check the dough to make sure it isn’t too dry or too sticky. Add more flour or water accordingly to get a smooth dough. Run the machine for another 30 seconds or so to knead completely. Gather your desired topping ingredients and get ready to roll! For best results, be sure to preheat the oven to 425 F or 450 F for at least 20 minutes! Next Wild Blackberries are Ripe and Ready in Seattle!